Welcome to The Abso!ute Sound online! We explore music and the reproduction of music in the home. We believe that the sound of music, unamplified, occurring in a real space is a philosophic absolute against which we may judge the performance of devices designed to reproduce music. Our goal is to provide the resources consumers need to judge how a component's sound either honors or departs from the music's truth, and to make sound purchasing decisions that maximize their experience of reproduced sound. Below is our Issue 206, October 2010 table of contents and link to the editorial. 12 Future TAS: New products on the horizon. The father of modern direct-to-disc recording has pulled his lathes out of mothballs and is cutting LPs again. Neil Gader talks to this legend about vinyl's resurgence, Sheffield Lab, and high-resolution digital. Wayne Garcia looks at four cartridges at four different prices. Chris Martens on a swell phonostage and an equally swell analog set-up accessory from audio pioneer Jim Fosgate. Neil Gader listens to the best cartridge yet from analog specialist Sumiko. Each of these three affordable European-made 'tables has its own charm, says Wayne Garcia. Paul Seydor on an outstanding linear-tracking record player from Denmark. Jonathan Valin on a superb Swiss phonostage that does cost a mint. 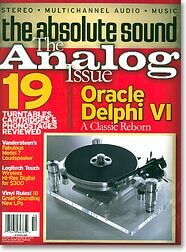 In this monumental project, Harry Pearson evaluates eight contenders for the state of the art in phono cartridges. A high-res music server for under $300? Steven Stone on a price breakthrough. Paul Seydor on a new addition to a venerable line of affordable, high-performance cables. Anthony H. Cordesman on this ambitious player from the mind of Ed Meitner. Forget everything you know about Vandersteen speakers; the Model 7 and its balsa-wood drivers are nothing short of revolutionary. Robert Harley reports. The loudspeaker pioneer talks with Robert Harley about the ten-year development effort behind the Model 7. Jeff Wilson on the resurgence of vinyl in today's marketplace. Ten fabulous LPs of 20th century chamber music masterpieces get Mark Lehman's enthusiastic recommendation. Tom Petty and the Heartbreakers' newest on new vinyl, plus vinyl reissues and rediscoveries from Dire Straits, the Velvet Underground, Uncle Tupelo, and Pantera, along with recent CDs from Richard Thompson, Mark Chesnutt, and Lissy Walker. LP reissues of Wagner, Moussorgsky, and Rachmaninoff; new music from Gabriel Prokofiev (grandson of Sergei) also on LP; and Henri Dutilleux on CD. Five (count 'em) just-out black discs of jazz: new releases from Fred Hersch, Jakob Bro, and Christian McBride, and top-quality reissues from Ray Charles and Frank Sinatra. Industry stalwart Frank Van Alstine talks with Neil Gader.